I am relatively happy with the intelligence that I have been given, because I know that I will never have to worry about crossing that line between being a genius and being insane! I was reading an article about Michael Clarkson in the Toronto Star. He is a former "Star" reporter and he has built himself a refuge at the bottom of his garden. He spends a lot of time there either thinking or de-thinking, that is, somehow trying to rid himself of some of the 66,000 thoughts per day that each of us has, according to Clakson. Also, according Clarkson, two thirds of these thoughts are negative. Now that's depressing!!! Too bad no-one taught Michael to knit. Or maybe someone tried and failed - more negative thoughts. Anyway, I am sure that, if this reporter spent more time absorbed in an all-absorbing activity, such as, knitting, he wouldn't have to spend so much time in a make shift lean-to in the garden, especially now that the weather is turning cold and the days are drawing in. I know that a lot of meditation is about trying to rid ourselves of "thought overload" - especially the negative thoughts. However, anyone who knits, and particularly those who knit lace, know that concentrating on a beautiful, intricate pattern, not only focuses the mind, thereby reducing thought overload, but also, replaces negative thoughts with positive ones. 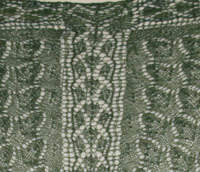 Plus after all that concentration, the knitter is rewarded with a lovely scarf or shawl. 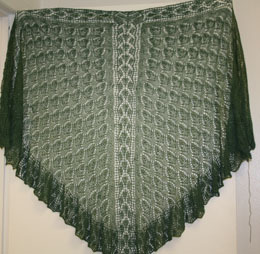 Behold, the product of my latest Zen time - Taurus Shawl! I am knitting through the signs of the Zodiac and Taurus is the 4th shawl to date and the last of the fixed signs - now to write them up as patterns so that others can knit them, if they like, and feed their inner Zen. Oh, the healing, in a ball of yarn, a chart and a circular needle! Dinner? maybe something simple, not too macrobiotic, but perhaps, a little spartan. How about lentil soup. In fact I am actually going to make this recipe tonight. I'll tell you how it goes. After I cast on for Sagittarius, the first of the mutable signs.